English walnuts—great vegetarian source of omega 3. Salmon—excellent fish source of DHA and EPA omega3. 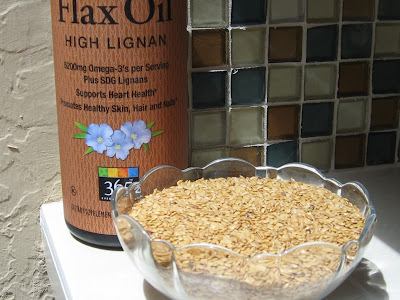 Flax seeds and oil. Highest vegetarian source of omega 3. 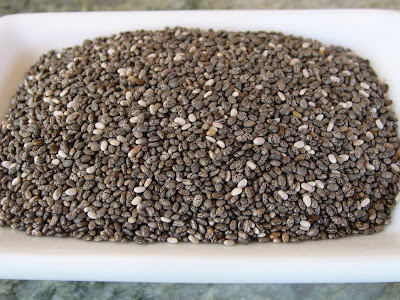 Raw chia seeds—high in omega 3 and fiber. 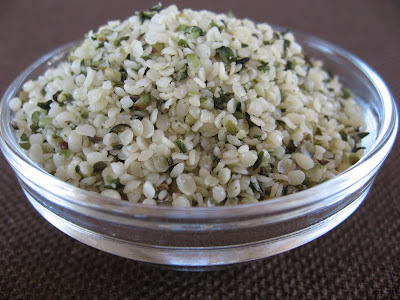 Raw hemp seeds—high in omega 3 and protein. Over the past years, there has been increased emphasis on obtaining sufficient omega 3 fatty acids. This essential nutrient is needed for healthy arteries, brain development, proper immune function, reducing inflammation, preventing and managing heart disease, depression and joint pain. Symptoms of omega 3 deficiency are extreme fatigue, heart problems, poor memory, lack of concentration, depression, poor immunity, blepharitis (dry eyes), brittle hair and nails and dry skin. Besides taking a daily supplement of fish oil or flaxseed oil, many wonder how to get what they need. Today I want to discuss foods that provide the highest concentration of this essential nutrient. There are three key omega 3 fatty acids: ALA (alpha-linolenic acid), DHA (docosahexaenoic acid) and EPA (eicosapentanenoic acid). DHA and EPA are the fatty acids that are the most beneficial to your health. The body can manufacture DHA and EPA from ALA. Unfortunately, some people are not capable of doing this conversion efficiently so if you are not a vegetarian, your best bet is to eat fish. Vegetarians must either take algae supplements that contain DHA and EPA or consume large quantities of ALA daily. How Much Omega 3 do you need? • The Institute of Medicine, 2002, recommends 1.6 g of omega 3 for adult males and 1.1 g for adult females per day. • The American Heart Association recommends that healthy people should eat oily fish at least twice a week in addition to consuming (vegetarian) foods rich in ALA. They also recommend that people with cardiovascular disease consume 1.0 g of DHA and EPA per day. (Why wait until you have heart trouble, maybe we should eat that much now!). • Because vegetarians do not eat fish, the Vegetarian Society recommends 4 g of ALA per day in order for the body to manufacture sufficient quantities of DHA and EPA. Large quantities of omega 6 fatty acids can interfere with the body’s ability to do this conversion so a balance of about 4 to1 omega 6 to omega 3 is said to be beneficial. Omega 6 is abundant in commonly eaten foods such as peanuts, pine nuts, poppy seeds, sesame seeds, pumpkin and squash seeds, pecans, soybeans, almonds and safflower oil. Unfortunately, the typical American diet provides over ten times the required amount of omega 6. • A study by the University of Pittsburgh Graduate School of Public Health showed that Japanese men having twice the levels of omega 3 fatty acids than white American men or Japanese Americans had the lowest levels of atherosclerosis. The average intake of Japanese people is about 2.6 g per day of omega 3, including 1 g per day of DHA and EPA (according to the Japan Society for Lipid Nutrition). Fish Rich in Omega 3 (DHA and EPA) and Low in Mercury (Sources for this data include (1) Nutritiondata.com (2) Appendix G2. Description of USDA Analyses, High Omega 3 Fish Analysis and (3) NRDC Consumer Guide to Mercury in Fish). 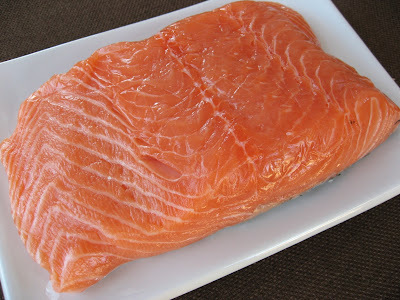 • Salmon is one of the best sources of omega 3, especially in DHA and EPA, while being very low in mercury. Atlantic is the best, both farmed and wild, with 3 dry cooked ounces providing 2.2 g (wild) and 1.9 g (farmed) of omega 3. Most of the omega 3 is in the form of DHA and EPA with 1.6 g in wild and 1.8 g in farmed. Chinook is also very good with 1.8 g of omega 3, 1.5 g of which is DHA and EPA. Pink salmon is next with 1.2 g omega 3 (1.1 g DHA and EPA) followed by canned sockeye with 1.1 g omega 3 (1.0 g DHA and EPA). Wild Coho is lower than the other salmon mentioned but still contains a respectable 0.9 g of omega 3, almost all of which is DHA and EPA. • American Shad, found in the Connecticut River, is a local favorite. A 3 ounce serving (raw weight) contains 2.3 g of omega 3 (2.0 g DHA and EPA) and is also a very good source of niacin and selenium. Shad is also a low mercury fish. • Pacific Mackerel and Atlantic Mackerel are both very good sources of omega 3 and contain little mercury. A 3 ounce dry cooked serving of Pacific mackerel contains 1.8 g of omega 3 (1.6 g DHA and EPA) while a similar serving of Atlantic mackerel has 1.2 g (1.0 g DHA and EPA). They both also provide niacin, vitamin B12 and selenium. Although Spanish mackerel is also a good source of omega 3, it is high in mercury. King mackerel is not a good source of omega 3, has a very high level of mercury and should be avoided. • Whitefish packs in 1.7g of omega 3 (1.5 g DHA and EPA). It can be enjoyed regularly as it contains little mercury. • Pacific Oysters are one of my favorites. A 3 ounce serving provides 1.3 g of omega 3 (1.2 g DHA and EPA). They are also a very good source of vitamin B12, iron, zinc, copper, manganese and selenium and are very low in mercury. For those of us who mostly eat a vegetarian diet with occasional seafood, oysters are a good pick because they provide B12, iron and zinc. These nutrients are more difficult to get from the plant kingdom. • Trout, both wild and farmed, are good sources of omega 3, both providing about 1.0 g per dry cooked 3 ounce serving. Farmed contains 1.0 g of DHA and EPA while its wild counterpart provides 0.8 g. Both are very good sources of B12 and niacin. • Prohibit the use of antibiotics and growth hormones or animal by-products in their feed. • No “Franken fish”—genetically modified or cloned seafood. • Fish are in low-density pens. What about Tuna? Why didn’t this Popular Fish make the High Omega 3 List? Without a doubt, a tuna fish sandwich is one of the most popular lunches in America. Ahi tuna is also served in seafood restaurants and sushi bars throughout the country. As far as being a good source of omega 3 and safe from mercury, here’s what I have found out. • Light Canned Tuna in water is not very high in omega 3. Although it’s moderate in mercury content and can be eaten up to 6 times a month safely (according to the Environmental Protection Agency’s guide for pregnant women), you’d have to eat ten 3 ounce servings to get the same amount of omega 3 as a single serving of wild Atlantic salmon. • White or Albacore Canned Tuna in water has more omega 3 than light canned tuna (0.8 g per 3 ounce serving vs. 0.2 g), most of which is DHA and EPA (0.7 g). Unfortunately, it is high in mercury and should be limited to three or less servings a month by those at risk from mercury exposure ((pregnant women, women trying to get pregnant and children). • Ahi Tuna, also known as Yellow-fin or Big-eye, is the worst choice. It is low in omega 3 (less than 0.3 g), has the highest mercury content and should be avoided completely by those at risk from mercury exposure. • Flax Seeds have long been known for their high content of omega 3 weighing in at 6.3 g per 1 ounce serving. They are high in fiber (8.0 g per ounce) and are a very good source of thiamine and manganese. The omega 6 content is low at only 1.7 g per ounce so if you are trying to balance out the high omega 6 content of your diet, eating flax seeds is a good way to do it. One teaspoon of flaxseed oil contains 2.0 g of omega 3 and only 0.5 g of omega 6. • Chia Seeds provide 4.9 g of omega 3 per ounce and only 1.6 g of omega 6. Chia seeds are very high in fiber (11 g per ounce) and are a very good source of manganese, phosphorus and calcium. • Hemp Seeds are a very affordable source of protein, providing over 10 g per 1 ounce serving. They provide 2.8 g of omega 3 for every 7 g of omega 6 yielding a favorable 2.5:1 omega 6 to omega 3 ratio. You can get the same benefits of hemp seeds from hemp milk and even hemp ice cream (just bought this new yummy ice cream called Temp by Living Harvest Foods). 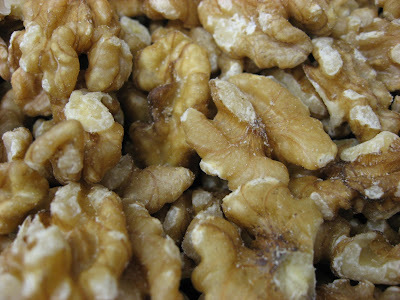 • English Walnuts have an optimal omega 6 to omega 3 ratio of 4.2:1. They provide 2.5 g of omega 3 and 10.7 g of omega 6 per one ounce serving. English walnuts are a very good source of manganese. Do not confuse them with black walnuts that only provide 0.6 g of omega 3 and contain over 16 times as much omega 6 as omega 3. I hope you have found this information useful. I devoted a lot of time on this because I think the low amounts of omega 3 in the American diet contribute greatly to the increasing level of illness and exploding costs of healthcare. So go and grab a handful of English walnuts, grill some salmon and top your meal off with a bowl of hemp milk ice cream! Growing up in an Italian American home, I was often presented with dried figs for dessert. I couldn't imagine why anyone would eat these things. They were difficult to chew and the hard seeds made them unpalatable. I swore that I would never make my children suffer through a dessert like this. As a young adult, I went to visit my friend Isabella who lives in Rome. After dinner, she served a bowl of beautiful, fresh figs. It took some convincing, but I tried one and immediately fell in love. I could hardly believe that this was the same fruit that I so disliked in its dehydrated form. It instantly became by favorite fruit but unfortunately I realized that they were not that easy to find. Since figs are extremely perishable, the ones in the store are pretty expensive and don't always look fresh. To avoid this problem, I began planting my own fig trees where possible. I encourage you, if you live in a warm climate, to plant a fig tree. I've had luck growing them in Texas and California. Figs grow easily and come in many varieties. My favorite is the Kadota fig which has a green skin and usually produces late in the summer and early fall. Since my husband and I just moved to a new home, one of the first things we did was plant a "Janice" fig, which is a seedless Kadota. I anxiously await the first harvest. Calimyrna figs are also light skinned. Dark skinned figs include black mission and brown turkey figs. Today's simple dessert combines the distinct flavors and health benefits of fresh figs and raw almonds. Figs are a good source of dietary fiber. Many people fail to meet the minimum daily requirement of 25+ grams of fiber, vital in the prevention of heart disease, cancer, diabetes, diverticular disease and other health issues. I've often thought that if a person could do one thing to improve their health, they should eat lots of fiber from fresh foods and whole grains (not just high fiber cereals). Figs are also a good source of potassium and manganese. Potassium helps regulate water and acid-base balance and is important in regulating blood pressure. Manganese is important in the metabolism of carbohydrates and amino acids. It supports bone health, blood sugar balance and energy production. Almonds are also a very good source of manganese as well as vitamin E. Vitamin E is an important antioxidant and difficult to get from a raw food vegan diet. It's also a good source of protein and magnesium. Magnesium is key for the proper functioning of muscles and nerves. It also supports energy production. If you have a fig tree or are lucky enough to have a neighbor with one, you can make a tray of these and serve them at a party. They make wonderful "finger food". Spread almond butter on top of each fig half. Sprinkle shredded coconut over the almond butter. Arrange on a plate and serve. Per serving: 86.6 calories, 3.6 g fat, .8 g saturated fat, .4 g cholesterol, .7 g protein, 13.3 g carbohydrates and 2.5 g of fiber. Toss fruit with date/peach mixture and produce protector. "Fruit-Fresh" produce protector prevents browning. The trees are ripe with peaches and the local markets are selling them by the basket. Blueberries are also plentiful right now so I thought I'd make a nice crisp blending their wonderful flavors. I've spoken quite often about the health benefits of blueberries so let's talk about peaches. Peaches are low in calories and rich in flavonoids and carotenoids - plant chemicals that serve as powerful antioxidants. According to nutritiondata.com (a terrific website for nutrition information), a large peach has 68 calories, 3 grams of fiber, 11.6 mg of vitamin C, 570 IU of vitamin A and 333 mg of potassium. You are all familiar with the baked crisps that fill the house with a lovely aroma (and I'll have some healthy recipes for those in the future also). But as I mentioned before, in the middle of the summer I don't want to heat the house so raw food recipes become very desirable. Also, raw food always provides you with the advantage of living enzymes so your body will have to expend less energy in the process of digestion. Vitamin C is extremely fragile and is destroyed easily by heat. Even though peaches are rich in vitamin C, much of it can be lost in the cooking process. A raw crisp will deliver a much higher concentration of vitamin C than one that is cooked. You will get an added boost of vitamin C in this recipe by tossing the cut peaches in "Fruit-Fresh"produce protector. I discovered this product when I was dehydrating fruit. It's a mixture of dextrose, ascorbic acid (which is vitamin C) and citric acid (naturally found in fruits, like lemons) and is used to prevent cut fruit from turning brown. Raw crisp recipes generally use lemon juice to prevent the fruit from discoloring. Unlike cooked crisps, excess moisture is not absorbed in the cooking process so if you add liquids, the crisp will get watery. I was excited to try using this product in crisps as it does what the lemon juice does without making the dish soggy. It has the added advantage of providing extra vitamin C.
To make the crisp, place almonds, walnuts, coconut, cinnamon and salt in a food processor with an S blade and process until course. Add the dates and raisins and process until the mixture starts to stick together. Remove mixture and set aside. Don't wash the food processor, you'll be using it again. To make the filling, place the sliced peaches and blueberries in a large bowl and toss together with the Fruit-Fresh produce protector. Place the chopped peaches, soaked dates and nutmeg in the food processor and process until smooth. 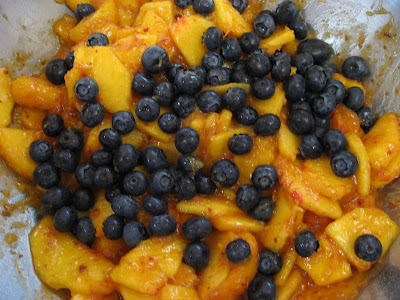 Mix in with the sliced peaches and blueberries. Spread 1/3 of the crisp on the bottom of an 8" by 8" pan. Place all of the filling on top of it. Sprinkle the remaining crisp over the filling. Serve immediately or refrigerate. Per serving: 221 calories, 10 g fat, 1.5 g saturated fat, .6 g cholesterol, 4 g protein, 32.9 g carbohydrates and 5.2 g fiber. Check out my Foods For Long Life Facebook Page. It's the middle of the summer and my garden is flourishing but it's hot and I don't want to cook anything that's going to heat up the kitchen. What a perfect time to prepare raw food! I must admit, when I posted a "one month raw cleanse" in May, it was still cold in many parts of the country. Cold weather makes people think of hot soup, not raw food. But in July, it's just perfect. Especially when a recipe takes minutes to prepare like this one does. Cheese on a Raw Food Diet? When I was visiting Redwood Hill Farm last week, (check out my post on July 16th), David Bice told me about their "raw goat milk feta". This cheese is made from raw goat milk and aged 60 days. It is never heated above 115 degrees so it retains it vital enzymes. A small amount of raw goat cheese in a raw diet can be beneficial since it's a source of vitamin B12, a vitamin that vital to your health and impossible to get from a 100% raw food vegan diet. And, did I tell you how delicate and delicious it is? Zucchini, and all summer squash, is rich in vitamins A, C, K and the B vitamins B1 (thiamine), B2 (riboflavin), B3 (niacin), B6 (pyridoxine) and folate. It provides important minerals like manganese, magnesium, potassium, copper, phosphorus, calcium, zinc and iron and contains some omega 3 fatty acids. Together with the other healthy ingredients, this soup is a good source of protein and fiber, yet low in calories, saturated fat and cholesterol. 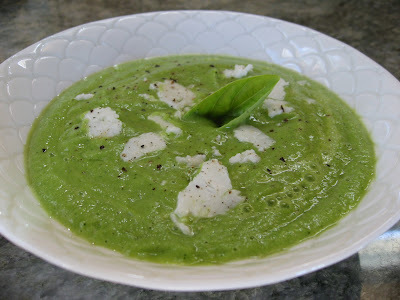 Blend zucchini, avocado, peas, basil, garlic, lemon juice, water and salt in a high speed blender until smooth. Serve in two soup bowls and top with raw goat milk feta and fresh black pepper. Per serving: 142 calories, 8.5 g fat, 2.8 g saturated fat, 12.5 g cholesterol, 6.5 g protein, 12.5 g carbohydrates and 4.8 g of fiber. It's nice to see mainstream getting on the chia bandwagon as Dr. Oz discussed the health benefits of chia seeds on Oprah's show this week. As you know, they are one of my very favorite foods and I have posted recipes using them in salad dressings, muffins and desserts. Today I'm going to share a recipe that takes few ingredients, is easy to prepare and contains some of the healthiest foods on the planet - chia seeds, hemp milk and blueberries. Hemp seeds and chia seeds contain both of the essential fatty acids alpha-linolenic acid (ALA) from the omega 3 family and linoleic acid (LA) from the omega 6 family. They also contain all of the essential amino acids making them "complete" proteins. Chia seeds are an excellent source of calcium containing 631 mg per 100 grams of seed. The tapioca consistency of the chia seeds along with the natural nutty flavor of hemp milk makes this a delicious and very healthy dessert. To top it off, we add blueberries with their powerful antioxidant abilities from "anthocyanins" known to neutralize free radical damage that can lead to heart disease, cancer, cataracts, glaucoma, varicose veins and other health issues. Blueberries are a very good source of vitamin C and manganese. They are also high in fiber and can be easily found in the local markets in the summertime. Frozen blueberries are available year round. Beware, not all hemp milk is alike. I love the Living Harvest (Tempt) brand. It's white, creamy and sweet tasting. Being new to hemp milk, I thought I'd try another brand so I picked up some Hemp Bliss. I noticed it was higher in protein but was very disappointed in its taste and its grey appearance. So for the best results, use the Living Harvest brand. This delicious "guiltless dessert" can be served to your family often with peace of mind. It delivers all of these incredible health benefits yet has zero cholesterol and less than 150 calories per serving. Enjoy! Combine chia seeds with hemp milk and liquid stevia and stir vigorously with a fork for several minutes. Let sit for 15 minutes and stir again until the chia seeds are well blended and separated. Let the mixture sit out for an hour, stir one more time and refrigerate 8 hours, or overnight, until thickened and firm. This is a good dessert to make a day in advance in order to give it time to set. When ready to serve, mix in the blueberries and divide into 4 small serving dishes. Per serving: 149.5 calories, 7 g fat, 1.5 g saturated fat, 0 g cholesterol, 5 g protein, 26.8 g carbohydrates, 8.3 g fiber, 3.5 g omega 3 and 3.7 g omega 6 fatty acid. Happy goats at Redwood Farm in Sebastopol. David Bice showing us a goat milk storage tank. Mango, orange, pineapple goat kefir. Kefir is a drinkable yogurt having many health promoting benefits due in part to its content of "live cultures". These live cultures are called "probiotics" and are the friendly bacteria commonly found in our gastrointestinal tract. A common intestinal bacterium is lactobacillus acidophilus. This and other friendly bacteria are essential for good health as they keep bad bacteria and yeast in check and boost our immune systems. They are especially important after taking antibiotics since this medication will kill the beneficial bacteria allowing the bad ones to flourish. This is the reason many people get a yeast infection or thrush after a course of antibiotics. Taking kefir can replenish your intestinal bacteria, but if you are taking it while on antibiotics, it is better not to drink the kefir at the same time. For example, if I were to take an antibiotic in the morning, for maximum benefit I would drink kefir in the evening. Acidophilus themselves have antibacterial activity and also help produce some B vitamins as well as vitamin K.
Goat kefir is more easily digested than kefir made from cows milk. Many people who are lactose intolerant can tolerate goat kefir but each individual is different. Goat milk products are high in calcium, phosphorus, vitamin B2, potassium and are a good source of protein. Although I am no stranger to goat yogurt, I was recently introduced to this delicious and healthful drink by David Bice during my visit to Redwood Hill Goat Farm in Sebastopol, California. I stopped drinking cows milk over 20 years ago and only use cows milk products, like parmesan or fresh mozzarella cheese on occasion. I feel much better about goat milk products, both from a health and a humane standpoint. Dairy farms tend to be larger and more "corporate". Goat farms tend to be family run where the goats are well cared for and happy. My opinion on this was certainly confirmed after visiting Redwood Hill Farm. Redwood Hill Farm and Creamery was started by Kenneth Bice in 1968 and is now run by Jennifer Bice, the eldest of his 10 children. Besides their delicious goat milk products (cheeses, yogurt, kefir), I was impressed by how devoted this family is to their animals. Each of their 300 "named" goats is loved and well cared for. It's hard not to fall in love with these little creatures. They are playful, curious and very affectionate. These goats are "certified humane raised and handled" which is a program intended to improve the lives of farm animals. The certification guarantees that the animals are not in cages, have ample space and shelter, handled in a manner to prevent stress and are never given growth hormones or antibiotics. David Bice was kind enough to give us a tour of the farm and the milking facility. He then brought out a chilled bottle of their mango, orange, pineapple goat kefir. It was amazing! The goat milk is not homogenized or over processed. They don't add sugar or any preservatives. And although it is not a "raw food", it is a "living food" as is contains 10 live and active kefir cultures. Their yogurt and kefir products are available throughout the U.S. in Whole Foods and other health food stores. You can buy their amazing cheeses, including a "raw milk feta", on their website (www.redwoodhill.com). I immediately started to develop recipes using this healthful product. 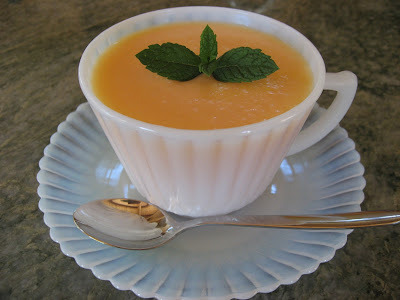 Here is a chilled soup recipe that can be enjoyed on a hot summer's day. Scoop out the cantaloupe and place in a blender with stevia or honey. If you are not using the flavored kefir, put the orange juice concentrate and fruit in the blender also. Blend until smooth but don't over process. Add the kefir and pulse until well mixed. Serve in a tea cup garnished with a sprig of mint. Per serving: 129.5 calories, 3.3 g fat, 1.9 g saturated fat, 7.5 g cholesterol, 3.9 g protein, 23.5 g carbohydrates and 1.3 g fiber. Gently remove dirt from plant. DO NOT WASH. Tie in bundles of 10 to 12. Hang sheltered for 3 to 4 weeks until cured. Cut tops with sharp scissors. Gently rub off top few layers of the bulb. Cleaned garlic bulb ready to eat or store. Store in cool, dark, well ventilated place and enjoy! You have successfully grown your first crop of garlic and may now be wondering, "what do I do now"? As the leaves start to turn brown, you may want to stop watering them for a week or more before you harvest so you are not digging up wet bulbs. According to TheGarlicStore.com, where I buy my organic garlic starts, you should harvest in early summer when the lower third to half of the leaves have browned. This will also depend on what variety you have planted and where you planted them. I dug up my Early Red Italian two weeks before the Kettle River Giant and four weeks before my Killarney Red. If you think it's time to harvest, dig up one or more plants as a test. To harvest, carefully dig deep under the plant lifting the soil, making sure not to damage the bulb. Sort through the clumps of dirt and find the garlic bulbs. Leaving the plants intact, gently remove most of the loose dirt from the roots and bulbs. DO NOT WASH THE BULBS. Never try to pull the garlic out of the ground by its leaves. The tops will just break off and you'll have nothing from which to hang and cure the garlic. You will now cure the bulbs before you store them or even bring them into the house or you will quickly discover that your entire house will smell of garlic. Curing them will eliminate the smell, prevent mold, and greatly increase their shelf life. Take about 10 to 12 plants and arrange them on the ground so they vary in length. Tie the tops together and hang the bundle in a well ventilated area. Make sure they are out of the sun and rain. Let them hang for 3 to 4 weeks or until they are dry. Once cured, cut the roots and leaves off and rub a few top layers off the bulb until you uncover a healthy, clean skin while leaving as much bulb wrapper as possible. Keep the cleaned bulbs in a cool, dark, well ventilated place. A root cellar at about 55 degrees F and 55% humidity is said to be optimum. DO NOT STORE IN THE REFRIGERATOR as this will cause the garlic to sprout. Save your largest bulbs for planting next year and enjoy the rest! This easy to prepare recipe is high in protein and fiber, low in saturated fat and contains no cholesterol. As a side dish, it can serve 16 people or more for less than 50 cents per person. Served with a fresh green salad it can serve 8 people as a dinner entree. It makes a lot so feel free to cut the recipe in half or enjoy the leftovers during the week. Although this is a "cooked" pasta dish, you can still get some of the benefits of raw food by using a raw sauce. Garbanzo beans, also known as chick peas, are a true power food. They are high in soluble and insoluble dietary fiber which helps lower cholesterol (total and LDL) and stabilize blood sugar levels. Garbanzo beans are an excellent source of molybdenum (see how it helps detoxify sulfites below) and manganese (important in energy production). They are also a good source of copper, phosphorus and iron (especially important for those who don't eat meat). Garbanzo beans contain all 9 essential amino acids. Essential Amino Acid Content in 1 Cup of Cooked Garbanzos. As previously mentioned, garbanzo beans are an excellent source of molybdenum, a component of the enzyme sulfite oxidase, which the body uses to detoxify sulfites. If a person is low in this trace mineral, they may suffer a reaction to sulfites. Sulfites are found in wine which is why some people get a headache and other allergic reactions when they drink it. Unfortunately, sulfites occur naturally in wine. In addition, they are often added during the winemaking process to stabilize the wine by inhibiting oxidation and stopping fermentation. Organic wines typically contain fewer sulfites than non-organic ones. In any case, the molybdenum in garbanzo beans may help detoxify these sulfites making garbanzos and wine a helpful pairing! It's fun to experiment with different nuts and herbs in pesto recipes. Classically, pesto is made with pine nuts and basil. Other nuts, like walnuts and pecans can also be used. I had a dish at a restaurant this weekend that used pumpkin seeds in their pesto. Basil can be replaced by parsley, cilantro, spinach and other green herbs and vegetables. Use your imagination and try different combinations. I like to use "raw" organic walnuts because of their high content of omega 3 fatty acid and their healthy ratio of omega 6 to omega 3. One cup of raw walnuts contains 44.6 grams of omega 6 and 10.6 grams of omega 3 fatty acids giving it a healthy 4:1 ratio. Pine nuts contain a similar amount of omega 6 (45.4 grams per cup) but almost no omega 3 (less than 2 tenths of a gram) giving it a 300:1 ratio (4:1 being optimum). In situations like this you can always improve the ratio by adding a teaspoon or so of flaxseed oil which is very high in omega 3. Drain and rinse garbanzo beans and set aside. Prepare a large pot of salted boiling water and cook pasta according to the "lower end" of the directions so it comes out "al dente". Run the garlic through the chute of a food processor until it is minced. Put the rest of the pesto ingredients in (basil, oil, walnuts, lemon juice, zest, nutritional yeast and salt) and process until smooth. 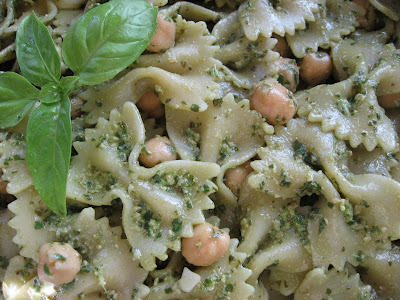 In a large bowl, mix the drained garbanzo beans with the hot, drained pasta. Mix in the pesto and serve. As an entree, serve warm. As a pasta salad or side dish, it can be served at room temperature. As is, this dish is vegan. Vegetarians and others may top with shredded parmesan cheese. Per serving: 372 calories, 12 g fat, 1.3 g saturated fat, 0 g cholesterol, 13.1 g protein, 57.7 g carbohydrates and 6.5 g of fiber. 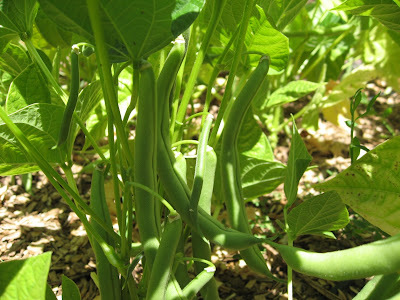 Bush beans are prolific and do not require a trellis. 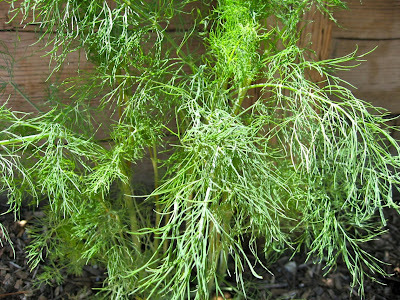 Fresh dill is easy to grow. I planted bush beans this year instead of pole beans and I'm really surprised just how many beautiful, large beans come from each little plant. So many, in fact, that I really need to come up with some clever ways to prepare them. I've never really liked to can beans since canning makes them lose their snap and frozen beans just don't compare to fresh. So I guess we'll have to eat them all! Here's my favorite way to prepare green beans. It's quick and easy and a perfect dish for entertaining since it can be served at room temperature. This dish can be made an hour or so before a meal and you don't have to worry about warming it. I'm lucky to have almost all of these ingredients from my garden - beans, dill, garlic and lemons. Green beans are great in any weight loss program. They are low in calories, high in fiber and are a very good source of vitamin A (through its content of beta-carotene), C, K, folate, iron, potassium and manganese. Green beans are also a good source of protein, the B vitamins Thiamine (B1), Riboflavin (B2) and Niacin (B3) as well as important minerals like calcium, magnesium, phosphorus and copper. With its vitamin and mineral content, especially that of calcium and iron, it's an important vegetable for vegans and vegetarians. It is even a good vegetarian source of omega 3 fatty acids. As a vegan or vegetarian main dish, serve over brown rice. These green beans also make a great ingredient when building a vegetarian antipasto (see my June 22, 2009 post). They make a great side dish, especially when paired with omega 3 rich grilled salmon. Steam green beans until fork tender (do not over cook). Mix together olive oil, salt, dill, garlic, lemon juice and lemon zest. Pour over cooked green beans and gently toss. Top with freshly ground black pepper to taste. Per serving: 43.5 calories, 2.3 g fat, .3 g saturated fat, 0 g cholesterol, 1.3 g protein, 5.7 g carbohydrates, 2.7 g fiber, 44 mg omega 3 and 236 g of omega 6 fatty acids. 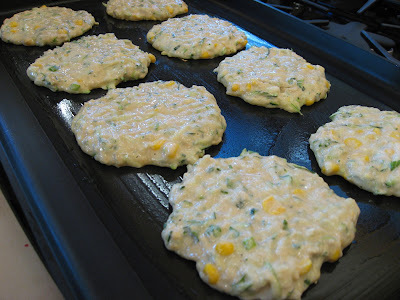 Zucchini pancakes on a no-stick grill. Preparing plums for making jam. I'm getting 3 zucchini a day from my garden and every plum on my plum tree ripened over a one week time frame. 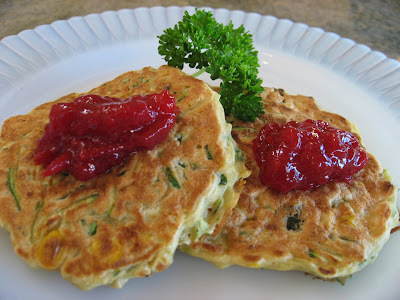 I decided to make zucchini pancakes and some healthy plum jam (some for the pancakes and a few jars to put away for the winter). Feel free to double or triple the jam recipe. The great thing about Pomona Universal Pectin is that you can you make two or three batches at one time. This recipe makes about 4 1/2 cups. This low calorie dish is perfect to prepare as a light summer dinner or for Sunday brunch. Serve together with side salad of fruit or greens. Best of all, it will help you use up some of that prolific zucchini! 1. Put 1/2 t white calcium powder and 1/2 cup water in a small, clear jar with lid. 2. Store in refrigerator between uses. Lasts a number of months – discard if settled white powder discolors. 3. Shake well before using. 1. Wash and rinse jars; let stand in hot water. Bring lids and rings to boil; turn down heat and let stand in hot water. 2. Prepare plums. Remove seeds and chop. 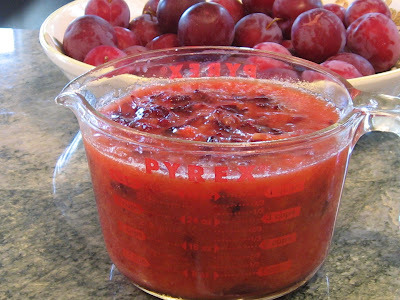 Measure 4 cups of chopped plums and put into a pan. 3. Add 4 teaspoons of calcium water into the pan and stir well. 4. In a separate bowl, thoroughly mix 3/4 cups of organic sugar with 3 teaspoons of pectin. 5. Bring fruit to boil. Add pectin-sugar mixture; stir vigorously 1 to 2 minutes while cooking to dissolve pectin. Return to boil and remove from heat. 6. Fill jars to 1/4 inch of top. Wipe rims clean. Screw on 2 piece lids and put filled jars in boiling water to cover. Boil 10 minutes (add 1 minute more for every 1,000 feet above sea level). Remove from water and let jars cool undisturbed. As they cool, the seals-lids should be sucked down (you’ll hear them pop). Lasts about 3 weeks once opened. Per 1 tablespoon serving: 12.5 calories, 0 g fat, 0 g saturated fat, 0 g cholesterol, .1 g protein, 3.1 g carbohydrates and .1 g of fiber. While packing the zucchini in a measuring cup turn it over and press out the excess moisture into the sink. Place the zucchini in a large bowl and stir in the whole wheat flour, baking powder and salt until the zucchini strands are well coated. Mix in the corn, parsley and scallions. Stir in the beaten eggs and soy milk. On a heated no stick griddle that has been lightly greased with olive oil, drop about 3 full tablespoons per pancake. Cook until they bubble (a few minutes or so depending on the heat of the grill) and flip over. Cook until brown and serve. Top each pancake with 1 tablespoon of plum jam or your favorite topping (applesauce, sour cream....). Per pancake: 47 calories, .9 g fat, .3 g saturated fat, 26.4 g cholesterol, 2.5 g protein, 6.9 g carbohydrates and 1.1 g of fiber. For decades I've had a personal struggle with heartburn and gastroesophageal reflux disease, also known as GERD. Although my diet has always been pretty healthy, certain "trigger foods" like orange juice, tomatoes and coffee cause painful reflux. Doctors prescribed the "usual" drugs like Zantac and Prilosec to reduce my stomach acid. That didn't make much sense to me since the stomach needs acid to digest proteins. Undigested proteins can cause allergic reactions and disease. I was also worried about the long list of side effects of these drugs. I went to my naturopathic doctor to find a natural remedy for reflux, heartburn and indigestion. I also did a lot of personal research. Between the two, I have been able to greatly reduce these painful episodes without taking "acid reducing" medication. Since I know there are thousands of people who suffer with this, I'd like to share what has worked for me. This is only MY experience and I am not recommending or prescribing this treatment for you. But perhaps you can learn something from my personal and successful journey, work with your holistic health care practitioner and get similar results. To make sure that you do not have a more serious condition like an ulcer, hiatal hernia, or any form of stomach or esophageal cancer, you may want to have an endoscopy. This procedure allows the doctor to directly view the upper GI tract. • Reflux can happen when your "lower esophageal sphincter", also known as LES, is weakened. This causes the acidic contents of the stomach to flow back into the esophagus. This is known as "reflux". • Indigestion can be caused by low stomach acid or hydrochloric acid (HCl). Our level of stomach acid decreases with age. HCl breaks down proteins into amino acids. It also kills bacteria and yeast found in food that can cause disease. In addition, HCl stimulates the pancreas and small intestines to produce digestive enzymes and bile needed for the digestion of carbohydrates, proteins and fats. Taking ant-acids reduces stomach acid further which can severely worsen the problem and prevent all of the above vital activities! • Digestive problems can be caused by a low level of digestive enzymes. Our level of digestive enzymes decrease with age. • Citrus fruits (I personally can tolerate lemon, lime and the occasional grapefruit but even the smallest amount of orange juice causes immediate heartburn. You may react differently). • My naturopath recommended I take a product called "Heartburn Free" by Enzymatic Therapy. It's basically 1000 milligrams of orange peel extract containing d-limonene. It claims to provide 6 months of relief (I got about 3). I took one soft gel every other day for 20 days (a total of 10 pills). It worked very well for me but you must make sure you don't have an ulcer before taking it. • Another product that really helps me is DGL, also from Enzymatic Therapy. DGL stands for deglycyrrhizinated licorice. I chew 2 tablets twenty minutes before each meal and it really soothes my digestive tract. • As I posted on May 31, 2009, I take digestive enzymes at the beginning of each meal. My favorite is "Source Naturals Essential Enzymes" which is a vegetarian, broad spectrum blend. • I find it very helpful to take a few teaspoons of unfiltered, unpasteurized, organic apple cider vinegar twice a day, especially when I eat a meal high in protein and fat. Raw apple cider vinegar (Bragg's is a good brand and is readily available in your local health food store) is known to aid in digestion by stimulating your stomach acid. Sometimes I mix it with a little local honey or stir it into applesauce. 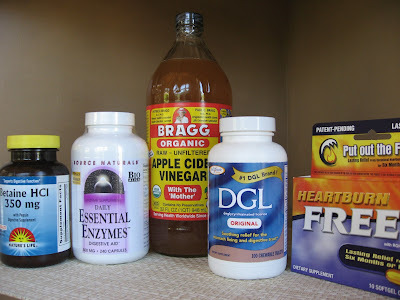 • People who are really low in stomach acid sometimes take Betaine Hydrochloric Acid supplements. I used to take these but I find that the apple cider vinegar works well enough for the amount of protein I eat. Big meat eaters, however, may require supplemental HCL for proper digestion. These should NOT be taken if there is ANY chance that you have an ulcer. I know it sounds drastic to give up some of your favorite foods and to make difficult life adjustments. You will have to be diligent at first to repair and reverse painful digestive problems. But once you get your heartburn and reflux in control, you may be able to add back some of your favorite things. You'll eventually know what foods and beverages cause the biggest problems for you and those you can occasionally tolerate. For me, I know I can never drink coffee or orange juice. But when I've got things in control, I can enjoy a plate of pasta with tomato sauce and a nice glass of wine. It's all about moderation! If you take away anything from this article, learn to do your own homework, consider some natural and far more healthy approaches and do not blindly support a multi-billion dollar industry that is trying to convince you that stomach acid is a bad thing. For most of us, it's not the problem, it's the cure! Corn on the cob is a favorite this time of year, especially as a side dish for your 4th of July BBQ. Unfortunately, it is usually drowning in butter. For a healthier and vegan friendly way to serve this popular food, try this easy recipe. Instead of butter, the fat used in this recipe comes from virgin, expeller pressed, unrefined, organic coconut oil. This type of coconut oil has been extracted by methods that do not use harmful chemicals or high heat and is readily available at Whole Foods, Trader Joe's or your local health food store. There is much debate and even more confusion as to the health benefits of tropical oils. Coconut oil is high in saturated fat but has no cholesterol. Being saturated, it is a stable fat which makes it less likely to form harmful trans-fats when heated. Although there has been much negative press in the past about tropical oils, (much of it sponsored by the American Soybean Association and the Corn Products Company), the places in which coconut and other tropical oils are consumed on a daily basis do not have a high incidence of heart disease. Coconut oil is high in lauric acid, a medium chain fatty acid which the body converts into monolaurin. Monolaurin has antiviral, antibacterial and antiprotozoan properties. That being said, coconut oil is high in calories and should be eaten in moderation. I get a bit concerned when I see the quantity of coconut oil used in raw food dessert recipes. In a recipe like this, however, a few tablespoons is a good alternative to butter. Gently melt coconut oil (put on low power in microwave for 10 seconds or more). Mix with lime juice and salt. Put all 16 pieces of corn in a large bowl. Pour the lime, coconut mixture over the corn and with your hands, thoroughly coat each piece. Sprinkle the chili powder evenly over the corn and place on a BBQ grill at low heat. Cook on all sides for a total of 10 to 15 minutes. Per 4 piece serving: 139 calories, 8 g fat, 6.5 g saturated fat, 0 g cholesterol, 3 g protein, 17.6 g carbohydrates and 2 g of fiber.